Kaspersky® Anti-Virus for MIMEsweeper integrates seamlessly with Clearswift MIMEsweeper to provide antivirus scanning and disinfection of incoming and outgoing traffic that passes through the security software. Email offers businesses a fast and versatile means of communication. It also, however, has its disadvantages; malicious programs and spam are commonly sent in email messages, and email also provides a channel through which confidential data can be leaked. Kaspersky® Anti-Virus for MIMEsweeper offers an additional layer of protection for the mail server on your corporate network. 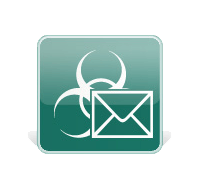 The application works together with Clearswift MIMEsweeper to scan incoming and outgoing email traffic in real time and, where possible, treat infected messages. Kaspersky® Anti-Virus for MIMESweeper is a plugin for Clearswift MIMESweeper. Clearswift provides all of the necessary software for integrating Kaspersky® Anti-Virus with Clearswift MIMESweeper.